When it comes to bringing British self-published voices to a greater stage Great Beast have made some inspired choices in the last few months. John Cei Douglas, Dan Berry and Isabel Greenberg are just some of the recent names to be added to their creative catalogue. 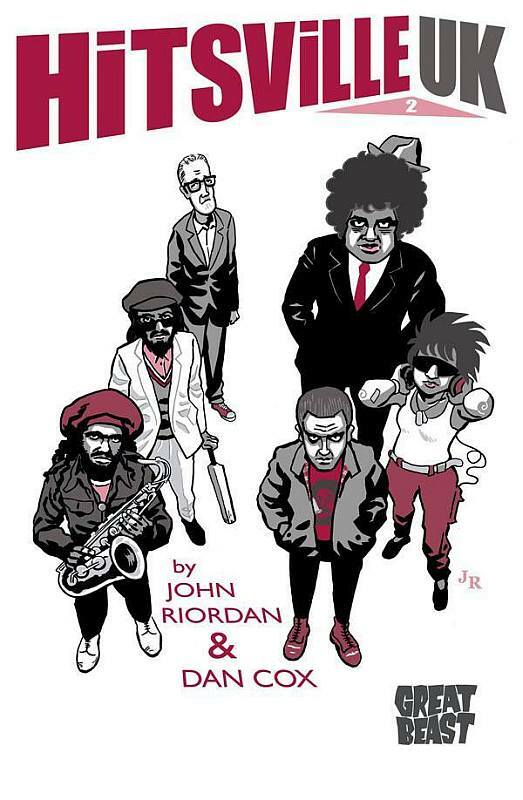 Last year the publisher re-launched John Riordan and Dan Cox’s ongoing series Hitsville UK, a kind of music biz parody I described here at Broken Frontier as “a riotous, frenzied whirlwind of a comic book”. It’s taken a while for this next instalment to reach us but, despite the title of the story here (‘The Difficult Second Issue’), I’m pleased to say that there’s absolutely no need for anyone to desperately grasp at the same cute industry terminology that I did in this column’s heading to imply that this follow-up fails to match the book’s glorious debut. For those yet to become absorbed by the rather unique experience that is Hitsville UK, then, a quick précis of the proceedings thus far. In that first issue we were introduced to the titular independent record label run by the worldweary owner Gerry Corden and nefarious “super producer” Greg Pastis (who appears to have had a name change since the original self-published issue), aided by (literally) demonic accountant Stan Van Horne. A whole host of bizarrely “out there” bands and performers were in their sights, including the Scooby Doo-like supernatural investigators The Carrie Nation’s Revenge, Gollum-style country singer Gwillum and “Spiv Hop” superstar Jack Spatz. In chapter two we discover the extreme degrees Greg Pastis will go to ensure no more ultra-earnest, guitar-playing, singer-songwriters are inflicted on the public, learn some interesting tidbits about Gerry Corden’s past, and witness more of Stan’s netherworldly business methods. Elsewhere music journo Rona Roads starts a feature on the Hitsville crew, Gwillum takes to the road on a spiritual quest, The Carrie Nation’s Revenge encounter neo-Nazi band Aryan 51, and the local library’s outreach initiative hosts a Rap Battle that introduces us to Da Tree Huggaz, The Wicked Witch of the Westwood and this issue’s definite breakout star, G-Nome. As you can see there’s an awful lot going on in Hitsville UK. What needs to be stated upfront is that Riordan and Cox make no concessions for latecomers amongst their readership or, for that matter, the established audience! There’s a large and sprawling cast of characters to keep track of whose back stories are drip-fed to the audience in increments across these two issues. Masterful pay-offs to running gags can be missed if you are not paying attention, and clever plot points are often obscured in the rapid fire pacing of the book’s narrative. But there are dividends on offer for those willing to carefully scrutinise each and every throwaway line. 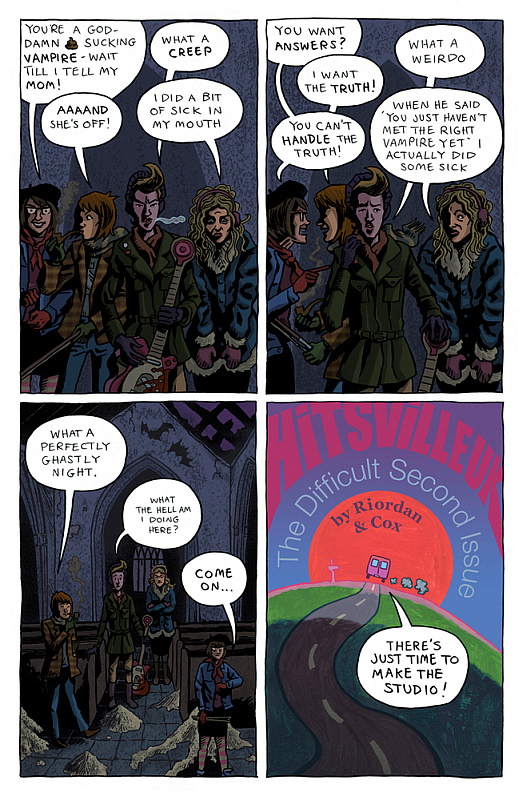 The brilliant pop punning and showbiz digs can be enjoyed on a superficial level but I suspect the multi-faceted subplots and character-led groundwork Hitsville UK is built on are going to produce some delightfully twisting turns in the issues to come. 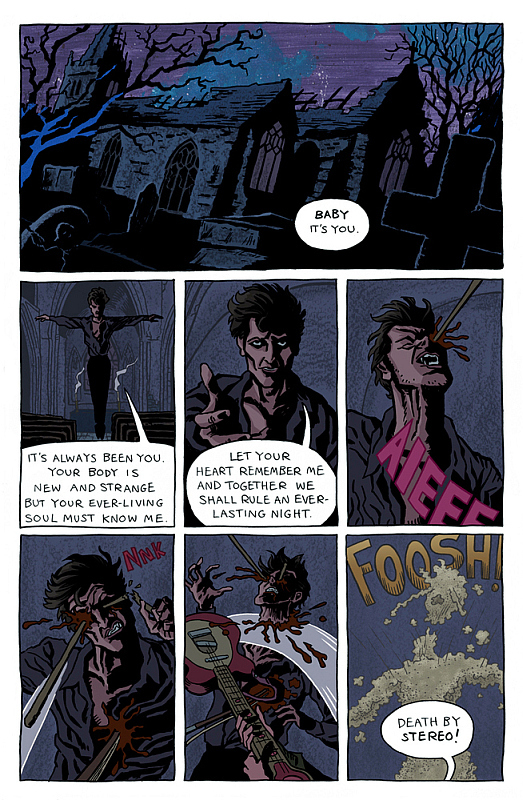 Riordan’s art was one of the big draws of #1. Here his pages are slightly less crammed than in #1, giving his panels more space to breathe, but it’s as strong a performance as that opening episode. From his effortlessly genre-jumping, mood-changing scenes – that can encompass everything from the horrific to the phantasmagorical – to that ace comic timing that brings those blackly humorous gags to life, it’s another flawless display of rhythmical visual storytelling. 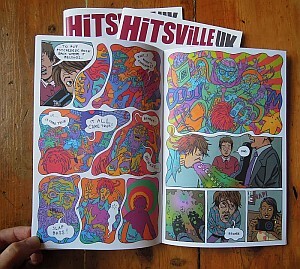 Hitsville UK #2 is not for the uninitiated or the casual reader but this strange, frantic, scene-hopping, patchwork quilt of a comic rewards those willing to invest the requisite time in its freaky, frenetic narrative style. 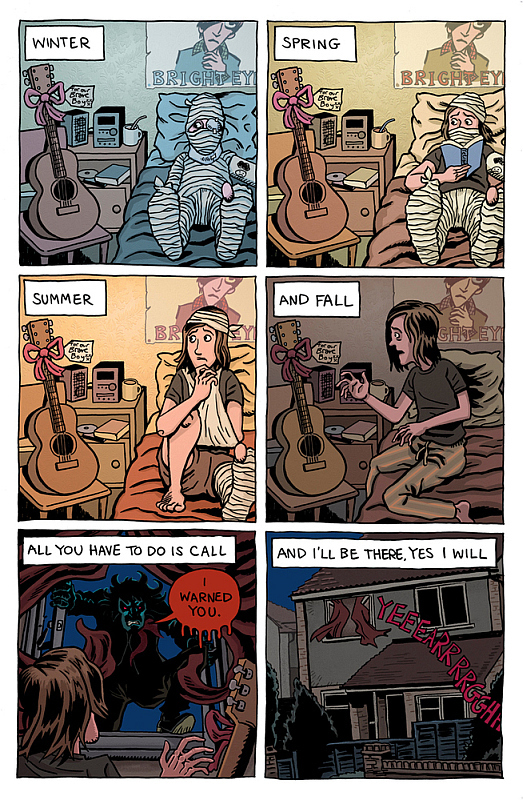 And any comic that includes as delicious a line as “You could have been the next Sonia” gets a thumbs up from me. 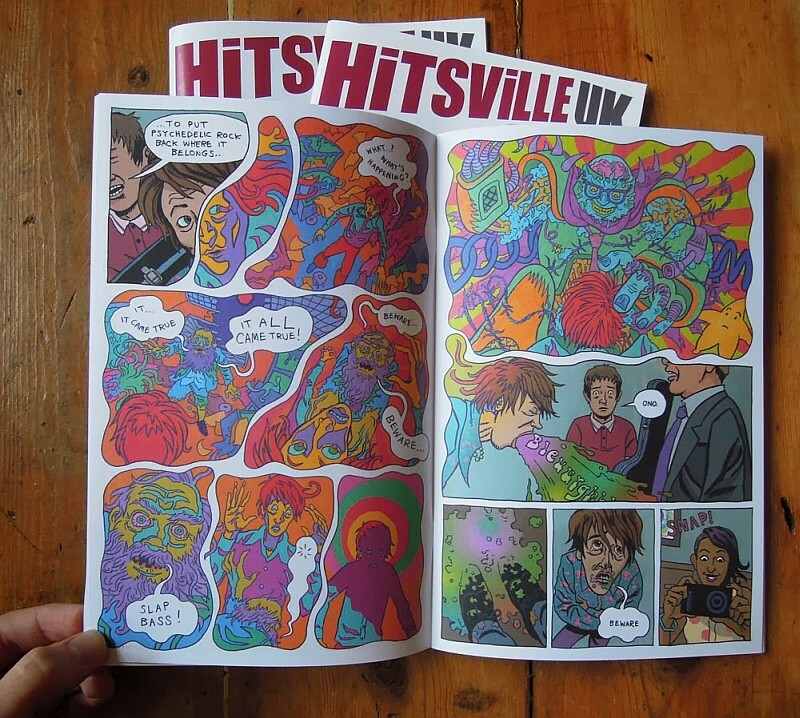 Hitsville UK #2 is an endlessly inventive cascade of ideas, full of irrepressible energy and represents another winner from Riordan, Cox and Great Beast! You can order both copies of Hitsville UK in either print (£3.50) or digital (69p) form here. For more on Great Beast check out their site here.